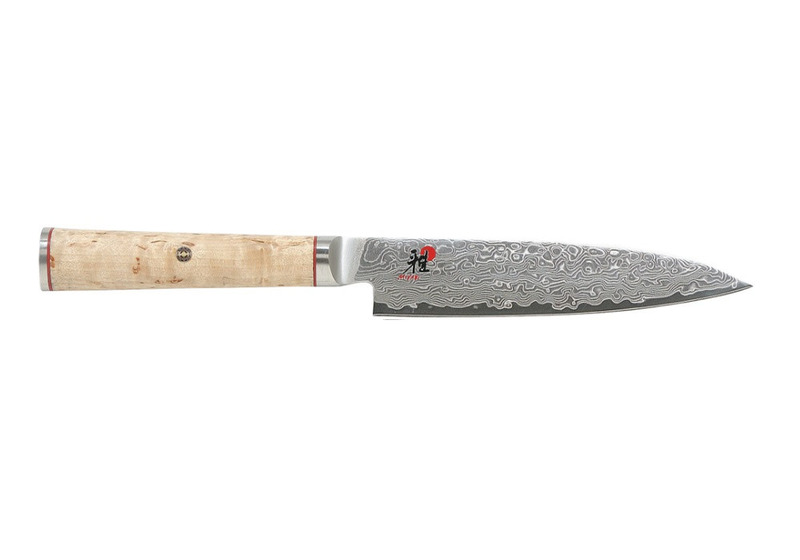 The medium-sized CHUTOH from Miyabi is ideal when you need to slice or cut meat or fish. The thin, stable 16 cm-long blade ensures that you have full control when working: precise working is simple with this knife. This is why it has convinced professional chefs from around the world. The core of the blade consists of MicroCarbide powder steel MC63, surrounded by 100 layers of two different hardnesses of steel. The CRYODUR® blade also undergoes a special ice-hardening process at -196 degrees Celsius giving it a hardness of around 63 Rockwell. The Honbazuke honing is responsible for its extremely scalpel-like sharpness. This sharpness is achieved by sharpening it twice between rotating stones and subsequently polishing it on a leather wheel. The handle has a traditional D-shape, as is usual with Japanese knives. It is comfortable to hold and is a real eye-catching utensil, thanks to its Masur birch handle. Its gentle graining stands out from the floral Damask pattern of the blade and presents a sophisticated contrast. Recesses in the stainless steel and fine red lines create stylish decorative elements. The CHUTOH from the MIYABI 5000MCD series stands out on account of its extreme sharpness.